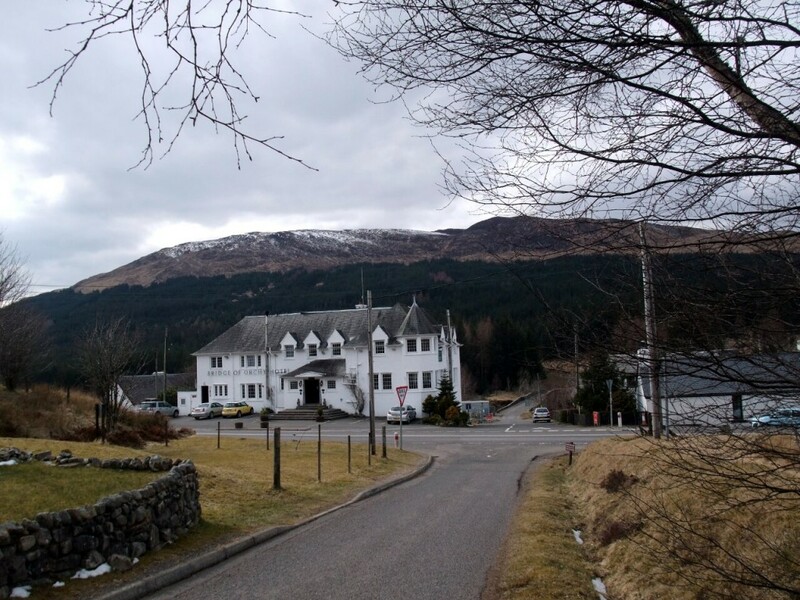 Most people who shoot through Bridge of Orchy in Scotland’s Central Highlands on the rapid A82 road to Fort William are probably aware of a large hotel rising beside the road and a railway line passing along the valley to their right. If they are observant they may notice hikers with bulky packs striding along the West Highland Way, one of Britain’s best-known long distance footpaths, which passes through the village. Most of them will be unaware the valley was once the home of 18th century Gaelic poet Duncan Ban MacIntyre, whose classic verses include a ditty about losing his sword at the Battle of Falkirk, a poem in praise of bagpipes, an Ode to Trousers, and the less memorable Song of the Bottle about … erm, drinking. 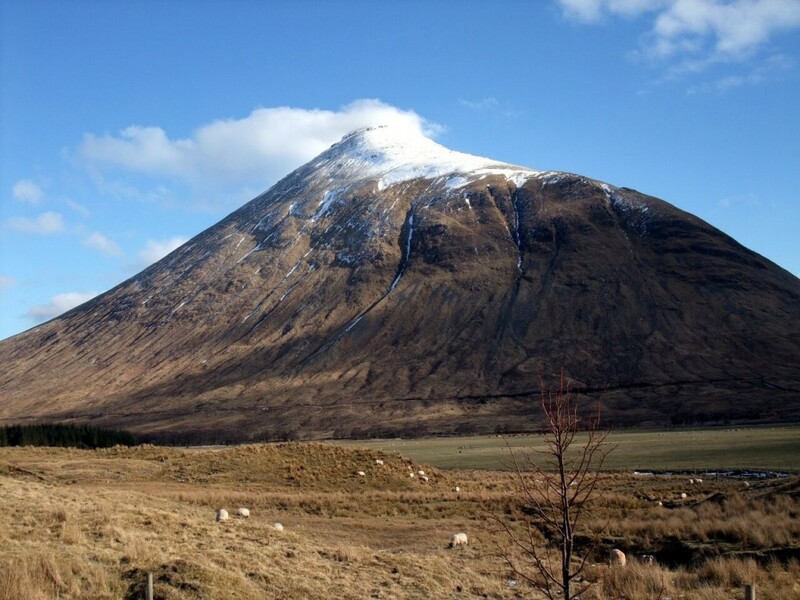 His most famous poem is In Praise of Ben Doran, about the mountain which rises above Bridge of Orchy to the east of the village, these days spelt Beinn Dorain. It has a distinctive conical appearance from the road heading north, but I was to discover this is deceptive. In reality the mountain is a long ridge, and if you approach it from the north as I did, it contains more false summits than there are hairs on a Scotsman’s sporran. It might be April and the beginning of spring, but I don’t need to remind anyone living in the UK there has been a lot of snow recently, and the conditions on Scotland’s hills are still distinctly wintry. 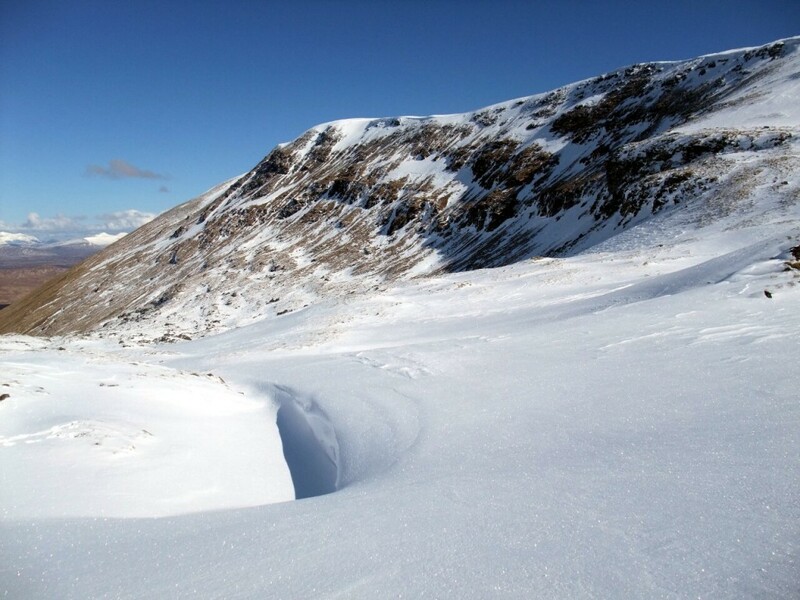 Before I headed north to spend the Easter weekend bagging a few Munros, I checked the Scottish Avalanche Information Service website, which told me the risk of avalanches was considerable on north and west facing slopes. I packed my ice axe and crampons, and chose my routes carefully. As things turned out, although a spot of caution was necessary, I couldn’t have wished for better conditions. 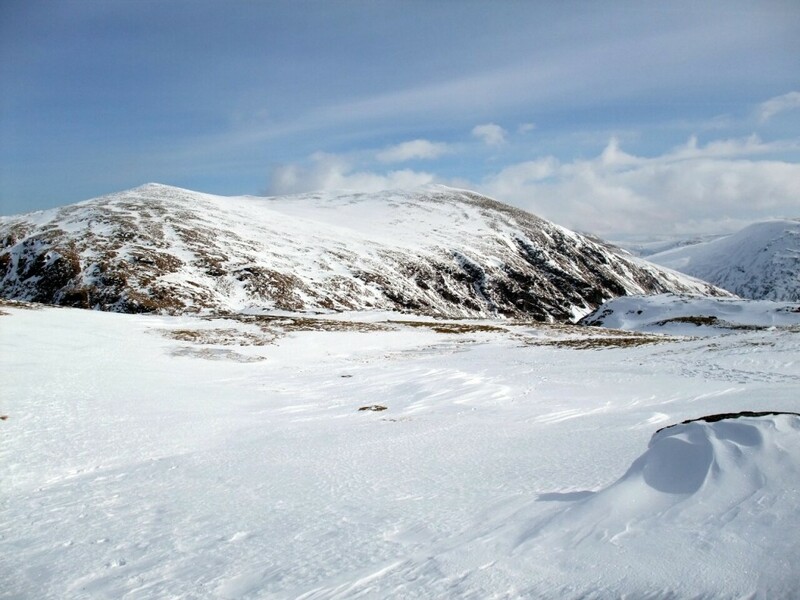 The Met Office website, which is brilliant for Scottish mountain forecasts because it tells you about conditions on mountain tops as well as sea level, indicated temperatures as low as -15°C with the wind chill. Crucially, the hills were cloud free and sunny, which meant snow conditions were perfect: hard, compact and well-consolidated. Even so, I decided to start gently. 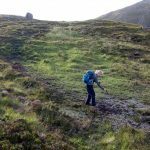 There are five Munros, including Beinn Dorain, in the range of hills to the east of Bridge of Orchy, and I climbed them in a series of three day walks. On the first day I had a long walk in along a dirt track to the gentle rounded summit of Beinn Mhanach, seen here on the right. MacIntyre didn’t like sheep, because he believed they were the cause of the infamous Highland Clearances, which led many a peasant peat-cutter to be evicted from their land, resulting in mass emigration to the New World. In fact I doubt if many sheep were even aware the Clearances were taking place, and probably spent most of the time innocently munching on grass and escaping from foxes. I climbed Beinn Mhanach by ascending grassy slopes on its south side. Towards the top the snow became thick, and at the saddle between Beinn Mhanach and its sister peak Beinn a’ Chuirn, I had a splendid view north to the long ridge of Beinn Achaladair and rounded top of Beinn a Chreachain, two Munros I ended up climbing the following day. Here I met my first walker coming down from the summit in crampons. 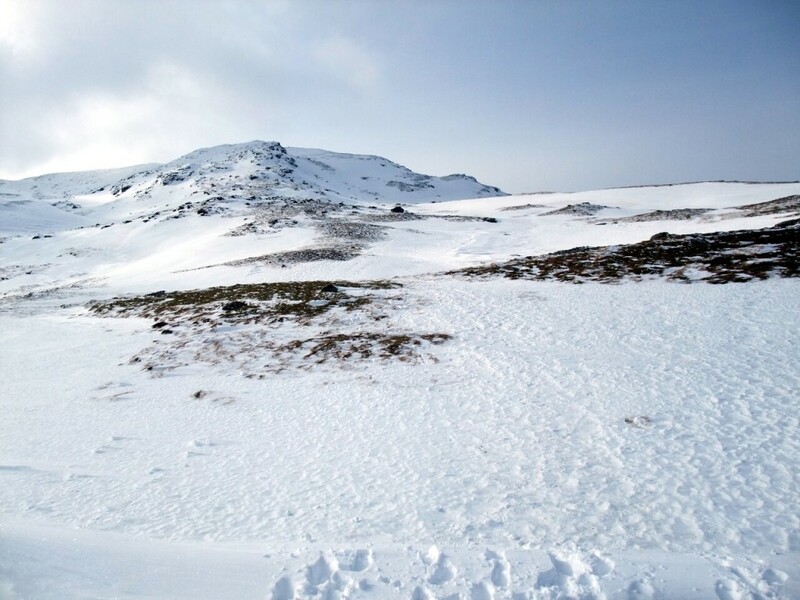 The slope had been gentle enough for me to ascend without putting mine on, but on the summit plateau the snow became firm and icy, and I wore them to descend. Perhaps the most dramatic aspect of gentle Beinn Mhanach is the view from the summit along Auch Glen, the route I had come in on. Beyond the far end the dramatic summit corrie of Ben Lui can be seen on the horizon, a mountain many people regard as one of Scotland’s most beautiful. I had briefly considered Ben Lui as an objective for this weekend, but its central gully is known to be an avalanche hotspot in winter conditions, and I thought better of it. The weather forecast was best for the second day of my trip, so I chose this day to do the more extended skyline ridge walk across Beinn Achaladair and Beinn a’ Chreachain. This was undoubtedly the highlight of my long weekend. These mountains lie on the northern fringes of the group, and to the north is the vast flat expanse of Rannoch Moor, Scotland’s equivalent of the Bermuda Triangle, where hikers have been known to disappear into the mist, never to be seen again. The moor is 150 square miles of uninhabitable peat bog with no roads. I’ve never crossed it myself, and though it’s rumoured to be featureless, from the mountains above it looks more attractive, with many small lochs and another line of peaks rising beyond. Today’s walk felt like proper mountaineering. The steep compacted snow slopes I encountered on much of the route would not have been possible without crampons, and I would have felt distinctly uneasy on some of them without my ice axe, which was available to arrest me in the event of a fall. I overtook two older hikers at the start of the walk, but otherwise I had the hills to myself all day, which was extraordinary given the amazing conditions. From the farmhouse at Achallader I headed south up the narrow gully of Coire Achaladair, which would have been a snow chute after more recent snowfall. The trail was hidden beneath snow, but I followed the boot prints of a solitary walker who must have come by there the previous day. Whoever they were, they wisely took a higher line up the steeper sides of the gully away from the fall line of any avalanche. At the top of the corrie was a broad snow col between the two Munros of Beinn an Dothaidh to the west and Beinn Achaladair to the north. 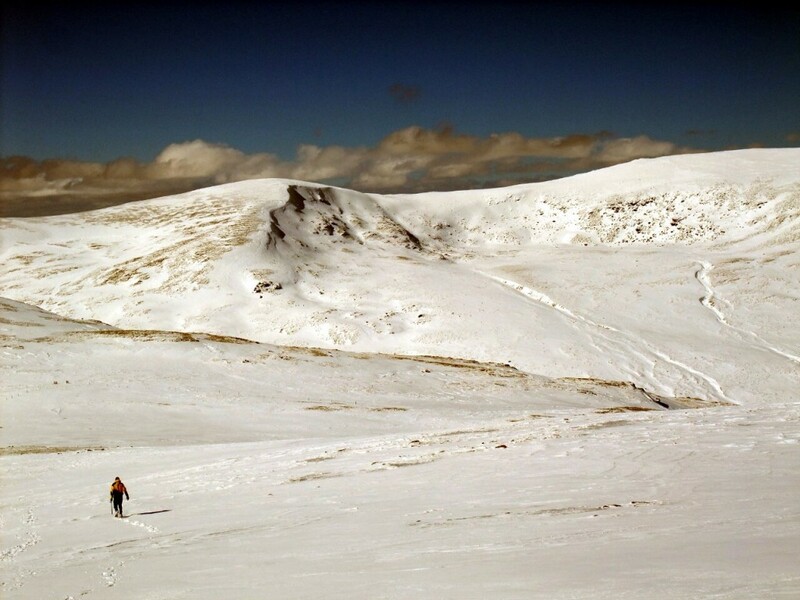 I doubled back to the north and followed Beinn Achaladair’s broad two mile summit ridge. It was a long slog, and although the wind was light it was bitterly cold on the ridgeline, which I could see curling round to the east and my second Munro, Beinn a’ Chreachain, over the smaller top of Meall Buidhe. The view from the summit of Beinn Achaladair was the best of the weekend. To the west I could see the seven Munros of Black Mount across Loch Tulla, all of which I climbed last July in a three day backpacking trip. To the north I could see Ben Nevis across Rannoch Moor, and to the west and south were the other hills and valleys I would be exploring over the weekend, including my old friend Beinn Mhanach. I descended a very steep snow slope and stopped for lunch in a small bealach (Gaelic for a col) before the final 320m ascent to Beinn a Chreachain. 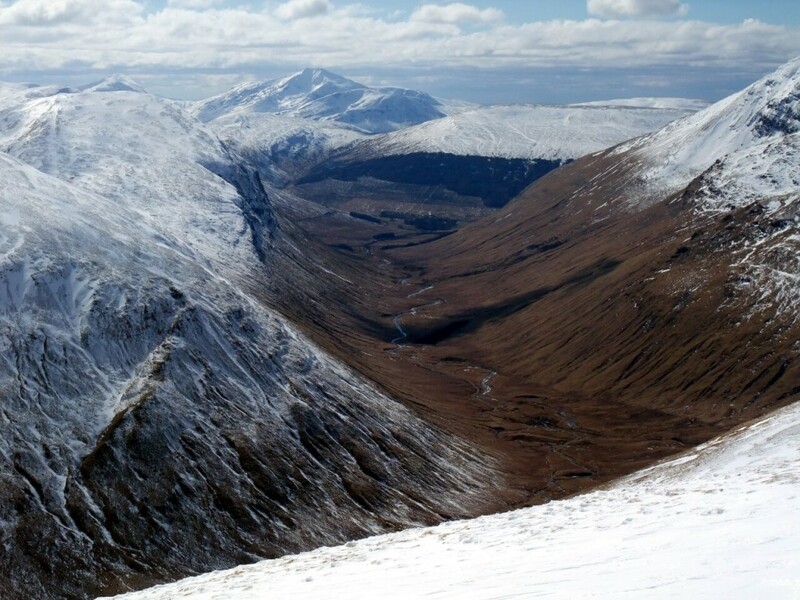 The ascent came in two stages, up Meall Buidhe, and then Beinn a Chreachain itself, separated by another broad snow plateau. Although Beinn a Chreachain looks the more interesting mountain, the view wasn’t as good as it was from Beinn Achaladair, which stands on the corner of the range and commands views across much greater distances. A fantastic narrow snow ridge led off Beinn a Chreachain to the northeast. Gradually it curled round to the north across gentler snow slopes, and as the snow petered out into grassy moorland I ran down the two mile hillside to Water of Tulla, the river which forms the southern boundary of Rannoch Moor. My walk back to the car formed a pleasant contrast, along the flat, with the hills I had just climbed forming a satisfyingly towering presence to my left. The following day I decided to see what all the fuss was about by climbing Duncan Ban MacIntyre’s Beinn Dorain. 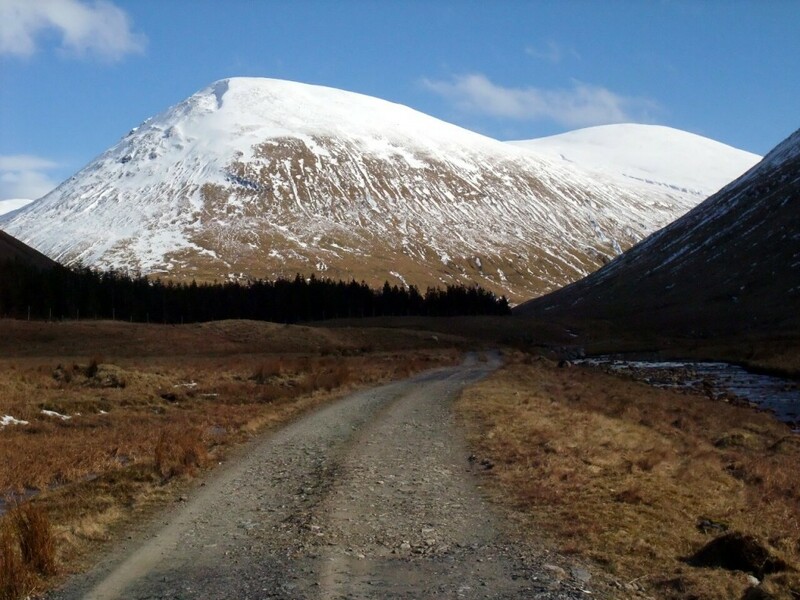 Two Munros are accessible from the car park at Bridge of Orchy, rising either side of a col at the top of an easy footpath. I say easy, but I began the walk with frozen boots, which meant I had to hobble awkwardly for the first few hundred metres until my feet had warmed up and softened the leather. This led two young walkers who saw me leaving the car park to believe I must be a bit of a frail old plodder who could be overtaken easily. Normally they would be right, but on this occasion I had an advantage. Above 500m the path became thickly snowlined, calling for confident ice axe and crampon work. While I’m not much of a climber, if there’s one thing I’ve had plenty of practice at over the years it’s plodding up steep snow slopes. They didn’t see me again until I was coming back the other way, some distance below the summit. By then my boots were suitably defrosted and the pace I was moving I must have looked a different man. One of them generously admitted they had been trying to keep up with me, but had given up a long time ago. 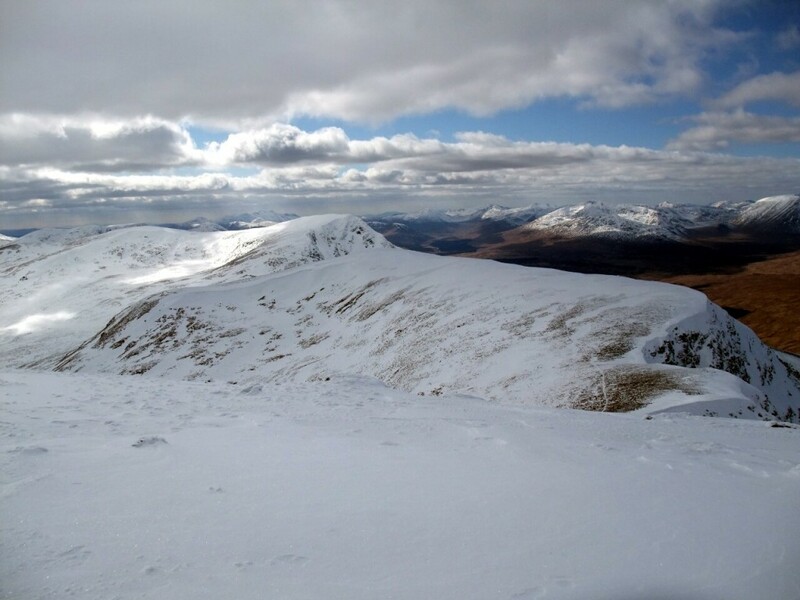 MacIntyre was right about Beinn Dorain being a most glorious mountain, though much of the enjoyment for me was due to the snow conditions. Below the col the path steepened considerably, and it was necessary to ascend a wall of snow in a series of zigzags. At the bottom of the wall I actually crossed the debris of a slab avalanche, caused when soft powder snow lies beneath a surface crust. Now the snow had consolidated the route was much safer, and the principal danger lay in a fall down the steep snow slope. As I approached the col a solitary mountain hare appeared over the lip, still in its white winter coat, but it bounded off again before I had chance to produce my camera. At the col I headed south up Beinn Dorain’s long summit ridge. It was very enjoyable to begin with. I reached a wide snow plateau strewn with rocky outcrops, and I felt like I could be in the polar regions. It was beginning to cloud over, though, and in the periods when the sun vanished from view it became extremely cold. 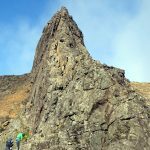 I counted at least five false summits along the ridge, and the last one, Carn Sasunnaich, was particularly annoying because someone had built a huge cairn on the top, of the sort you would normally only expect to find on summits. Only when I reached it could I see a dip in the ridge, with another summit cairn which was clearly higher rising through the mist beyond. At the true summit I found myself in cloud, and I ended up with frozen fingers preparing my tripod for a summit photo. Back at the col hordes of people were arriving. The proximity to the car park and pub at Bridge of Orchy clearly makes these two hills more popular than the others in the group where I found myself alone. Beinn an Dothaidh lies in the middle of a trio of rounded tops rising to the north of the col. Most people were taking a direct line up the middle, through a vast corrie, but I was tempted by an untrodden snow slope which took me up the left-hand top. Beyond its rocky summit, I curled to the right along the top of a lily white escarpment. Beinn an Dothaidh was my 86th Munro, and at the top I was looking across to the long ridge of my 83rd, Beinn Achaladair, which I had climbed the previous day. I celebrated an Easter weekend of perfect winter conditions on the Scottish hills with a pint in the bar of the Bridge of Orchy Hotel. 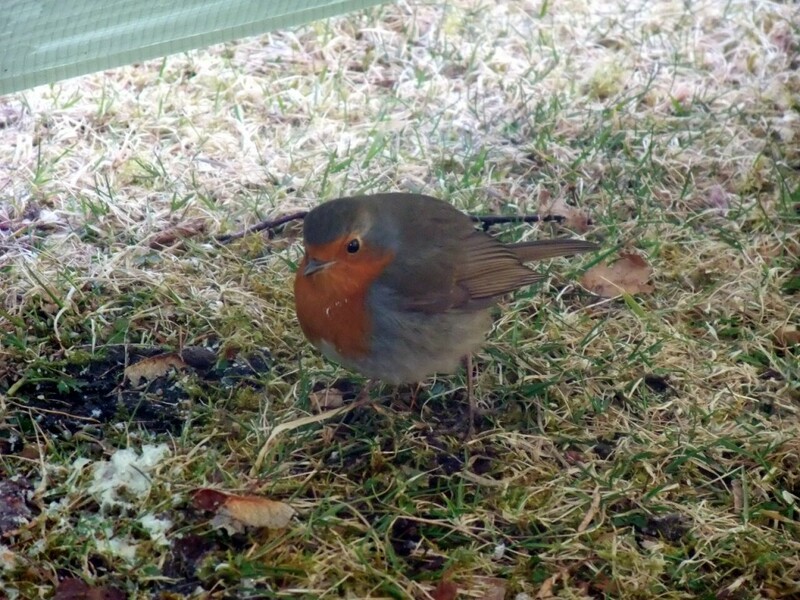 The following morning a bit of spilt egg white brought the following visitor to the porch of my tent at the campsite in Tyndrum. It was April Fool’s Day, and if I didn’t know any better then it could have been Christmas again. You can view all my photos from the trip here. Thanks, Kate. When conditions are like they were last weekend, Scotland’s mountains are as beautiful as anywhere! 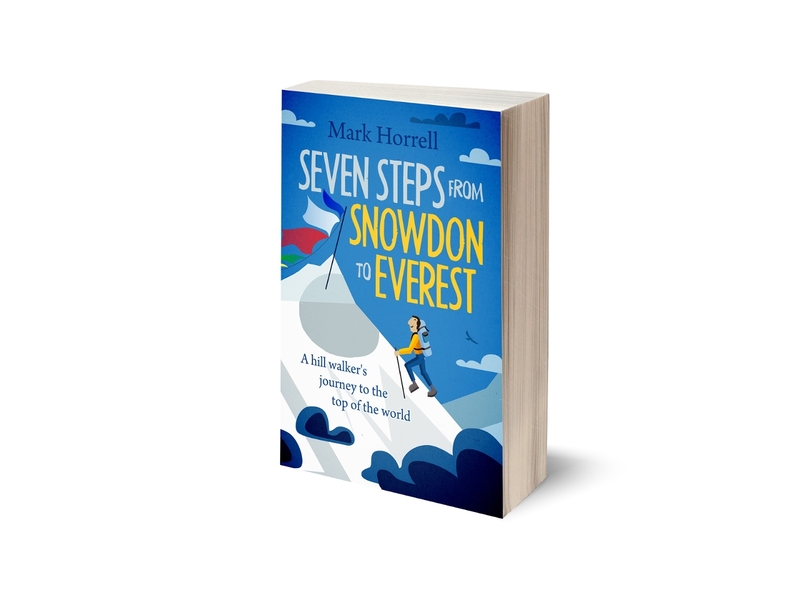 Hi Mark, I received a Kindle for Christmas and fortunately came across your Climbing Diaries and Books fairly quickly. I have become an avid follower and reader. Thanks for the insights to your adventures. 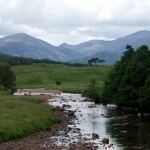 I have today come across your email and great pictures of your walks above Glen Orchy, a favourite walking area of mine. 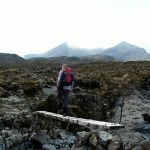 I could not agree more about your comments about Beinn Dorain, a wonderful mountain which I have climbed twice. Memorably once on my own on a beautiful July morning some years ago.I felt I had wings on my boots so easily did I find the eventual summit. With views right up and beyond Ben Nevis, I didn’t want to come down the mountain. Thanks for your very well priced and easy to read writings ,long may you continue to publish. Thanks for the kind words, Joe. Glad you enjoy the books. It was distinctly chilly up Ben Dorain this weekend, so I kept moving. My favourite this time around was the view from Beinn Achaladair.